Gorgeous Styled Shoot For Rocky Mountain Bride! 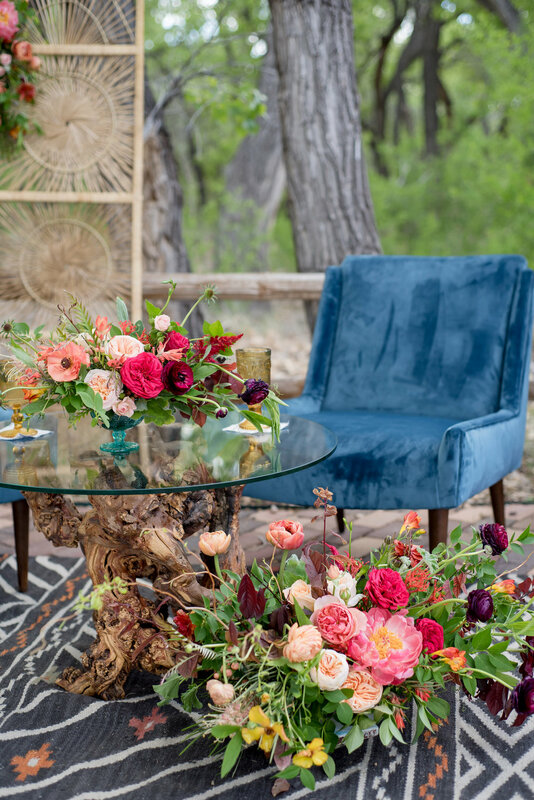 If you are all about the Southwest, or romantic, boho-chic vibes, then read on! This one is for you!!! 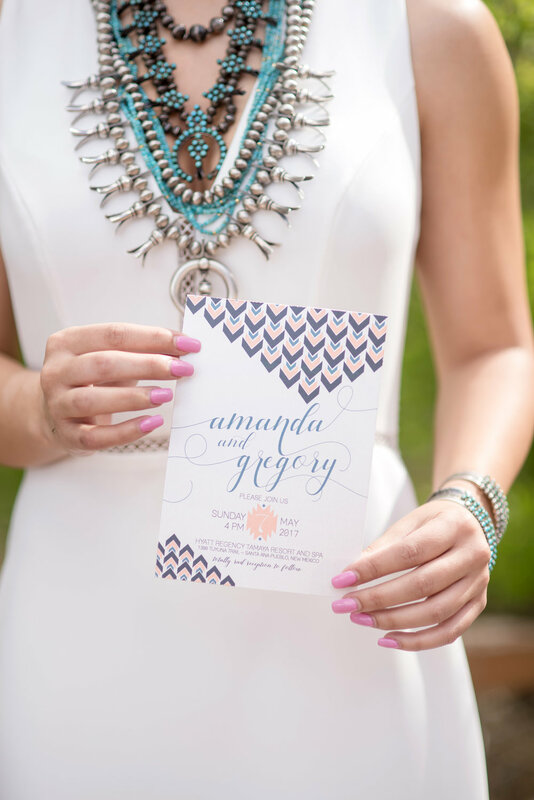 Our lovely model holding one of the southwest chic invitations designed for the shoot - I love all the #bohovibes! That squash blossom necklace is sooooo dreamy. More often than not, I have the pleasure and opportunity to work with some of the most talented, and most amazing wedding professionals that our beautiful state has to offer - usually it's for a real wedding, but sometimes we all get together and just let our creativity shine in a Styled Photo Shoot. This one in particular truly is one for the books - or, a magazine if you will! When Maura of Maura Jane Photography reached out to me and asked if I would like to design stationery for a styled shoot of course I was excited, and then she told me that it would be published in the premier issue of the New Mexico Rocky Mountain Bride Magazine and I was soooo excited! If you've not picked up a copy yet - run to your nearest store and grab your copy, it is absolutely filled with beautiful inspiration from gorgeous and unique venues, to drool worthy cakes, jaw dropping dresses and of course my favorite - pretty paper!!! Check out the response card.. it's adorable! The inspiration for the shoot was all drawn from the gorgeousness of the Hyatt Regency Tamaya, its beautiful, tranquil, and really a perfect setting for a #newmexicotrue wedding! 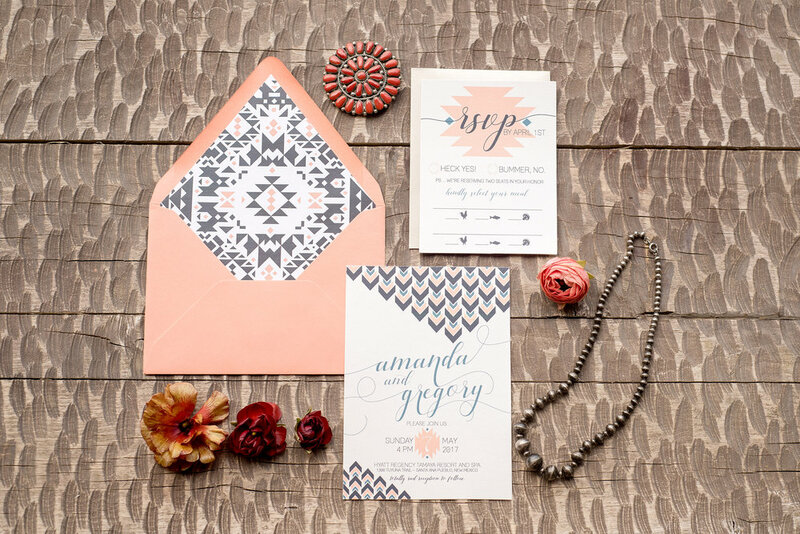 The stationery included a super rad pueblo-deco design with a gorgeous modern calligraphy font and my personal favorite - that patterned envelope liner! I am head over heels in looooooove with all of the gorgeous, lush florals that were included, and that knotted wood and glass side table??? To die for!!! To say that this shoot was like a dream would be an understatement - every. single. detail. 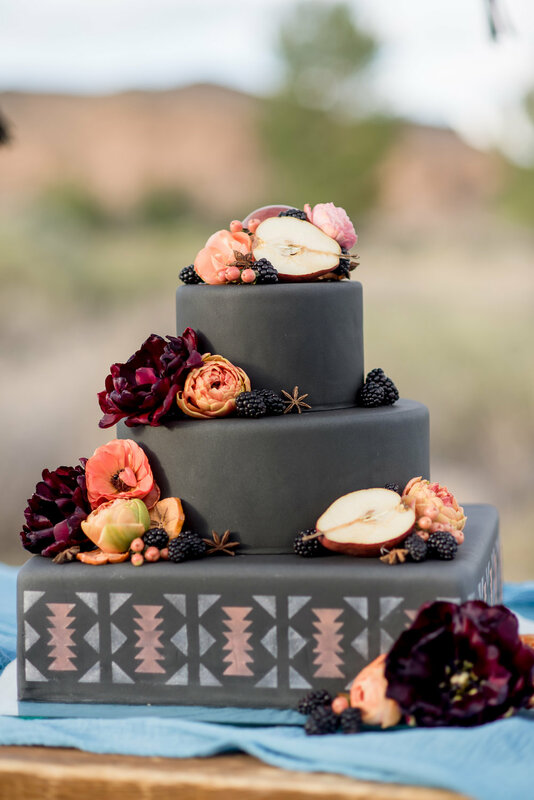 was meticulously planned out and so perfectly executed, from the abundance of lush floral bouquets, to the amazing squash blossom necklace worn by the bride, the shrub bar for cocktail hour, the groom's super suave suit, and just wait until you feast your eyes on THE CAKE!!! THIS. CAKE. GUYS. Black fondant forever!!!! Obviously, I LOVE all of the details that go into planning a shoot like this, but I know y'all want to feast your eyes on some of the surroundings, and of course the gorgeous couple - they are smokin' hot!!!! Want to see more of this stunning shoot? 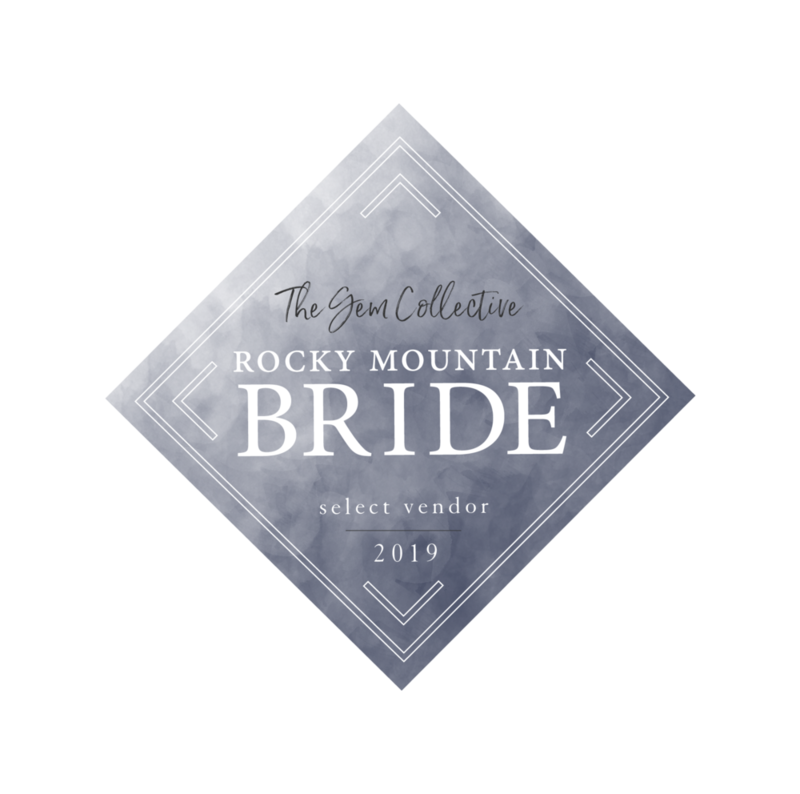 Then head on out to pick up your copy of Rocky Mountain Bride New Mexico!